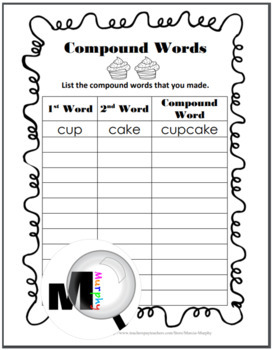 With this activity, students match vanilla cupcakes with chocolate cupcakes to create 12 compound words. 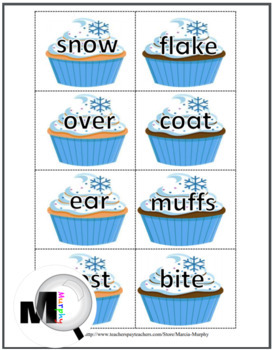 The 12 compound words included in this activity are: cupcake, earmuffs, fireplace, frostbite, outerwear, overcoat, pullover, snowball, snowflake, snowstorm, turtleneck, wintertime. This file is NOT editable. The blank cards can be printed, then a black sharpie marker or other writing instrument can be used to write words on the cards. The cards could be printed on card stock or photo paper and laminated for long-lasting durability. ***PLEASE NOTE! 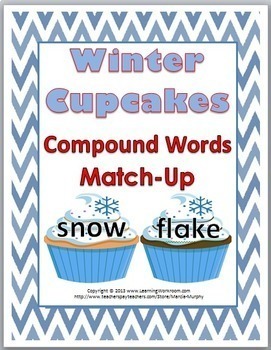 *** This item is included in my Cupcake Compound Word Match-Up BUNDLE. When you purchase the bundle, you will receive this product at a DISCOUNTED PRICE. 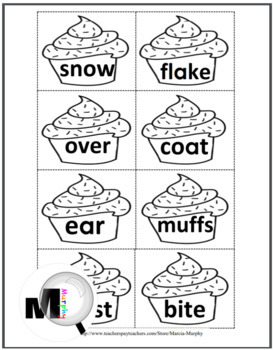 To view more of my ELA Activities and Posters, please click on the link below.